This week is Social Media Week, a semi-annual (February and September) event for anyone interested in social media. So what is social media? Definitions vary, but to me it’s any form of online collaboration and interaction including social networks, blogs, forums, wikis, microblogs, media sharing, online game worlds and much more. The event is made up of over 1000 presentations, panels, brainstorming sessions, games and parties which are held during the same week in multiple cites around the world. The particular cities vary from year to year. This time around they are Hamburg, Hong Kong, London, Miami, New York, Paris, San Francisco, São Paulo, Singapore, Tokyo, Toronto and Washington DC. Most Social Media Week events are free to attend, thanks to corporate sponsorship by Nokia, Oglivy & Mather, Constant Contact, The Guardian, The Next Web, Financial Times and Livestream. As you’d expect from an event focused on online interaction, Social Media Week has a website, plus a mobile webapp and native apps for Windows Phone, Symbian, Android and iOS. Being a mobile web guy, I checked out the mobile webapp first. It was created by Mobile Perspectives LLC and can be found at m.socialmediaweek.org. 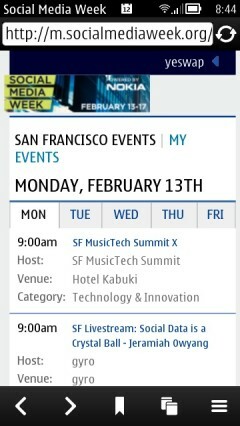 Its main feature is an interactive event schedule for all 12 Social Media Week Feb. 2012 cites. The event schedules are really nicely done. There’s a separate schedule page for each city. The page has tabs across the top to select the day of the week, with the day’s events listed below, chronologically down the page. Clicking an event leads to a page with details about the event including description, presenter bios, a map of the venue, and best of all, a Register button. Most Social Media Week events are free but you do need to register for each one individually. That sounds like a chore but it’s really easy with this webapp. Once you log in all you need to do to register for an event is to tap the Register button on the event page. That makes it really easy to register for events on the fly as your schedule evolves. 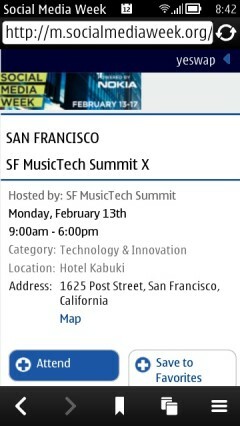 I wish all mobile event apps were as well designed and easy to use as this one. The webapp, at least the events schedule part, adapts to work in just about any mobile browser from Safari to Opera Mini to most feature phone browsers. If your are attending Social Media Week bookmark m.socialmediaweek.org on you phone now to keep you in the loop about what’s happening now in your city and around the world. This entry was posted in Events and tagged SMW, Social Media Week by Dennis Bournique. Bookmark the permalink. CD, gift prints, table book with pet images and so on based on the package.